When I went vegan six years ago Dresden had hardly any vegan options. It is a conservative city and even the liberal neigbourhood we live in was kind of a hopeless place. When we wanted to go out for a decent meal, we had to travel to Leipzig and Berlin. Of course that didn’t happen too often. Over the last couple of years a lot has changed. I don’t want to say we are the vegan food capital of Germany now (that is still Berlin) and we also don’t have places which serve fancy vegan food (like Zest restaurant in Leipzig, for example). But there are a few nice vegan options that I want to introduce to you in a couple of posts. We have two vegan restaurants, called Falscher Hase and Flax . Flax is pretty new and run by Chloé Vincent from New Zealand. 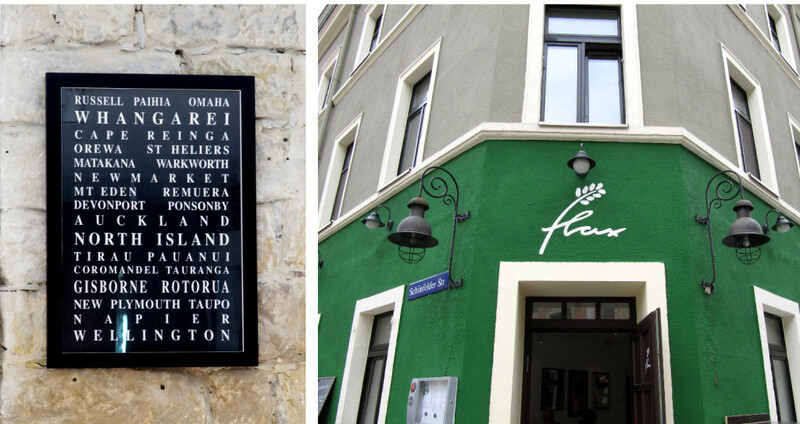 Like the other places I am going to present here, it is situated in the Neustadt neighbourhood. (Schönfelder Straße 2). The menu is comparatively small, but they have changing sweet and savoury daily specials. We have been there a couple of times now and really liked everything we had. We’ve even been there for breakfast once, but their opening hours have changed and I am not sure if they still offer this option. Make sure to check out their facebook page (linked above) for opening hours. The prices are great and the service is very nice. This time we ordered the Flax burger, which was made with a tofu patty, fresh vegetables, homemade mayo, and arugula pesto. It came with oven baked potatoes, more mayo, and a salad on the side. I like this burger very much, especially because I thought that the pesto was a great idea. And the homemade mayo is the best I ever had! P. chose quinoa sushi and oven baked potatoes with mayo. It all came on the same plate so he got to eat potatoes with chopsticks! Another great place is the recently opened first vegan café in Dresden, the Café v-cake, located at Rothenburger Straße 14. This place offers a variety of foods, you can get cakes and other desserts, müesli, soft serve, but also savoury stuff for lunch and dinner: soups, salads, sandwiches, and other options. We love that this place is large and has board games and books in a children’s play area. That means we can enjoy our food while our daughter has fun taking apart the board games. This time we had some soft serve ice cream and Maulwurfkuchen (mole cake – a chocolate streusel cake with banana and cream filling). You can usually choose from three cakes, the menu is always different. We have seen cheese cakes, cream cakes and fruit cakes. The sandwiches are great, too and they are made like sandwiches are traditionally made in Germany: whole grain bread, vegan butter, vegan cheese, some herbs. I have to say that I sometimes have really missed this kind of sandwich since going vegan. And since I almost never buy vegan cheese, I am glad they have a decent Butterbrot at v-cake. Of course you can also choose from several cold and warm beverages, too. Last time P. had a matcha latte. Another great thing is that you can decide what kind of non-dairy milk you want. I think they have soy, hazelnut, almond, and probably some more. Check the facebook page for opening hours and a glimpse at the cake options. I am very glad that we now have an 100% vegan café in Dresden-Neustadt! That is really a great gain. 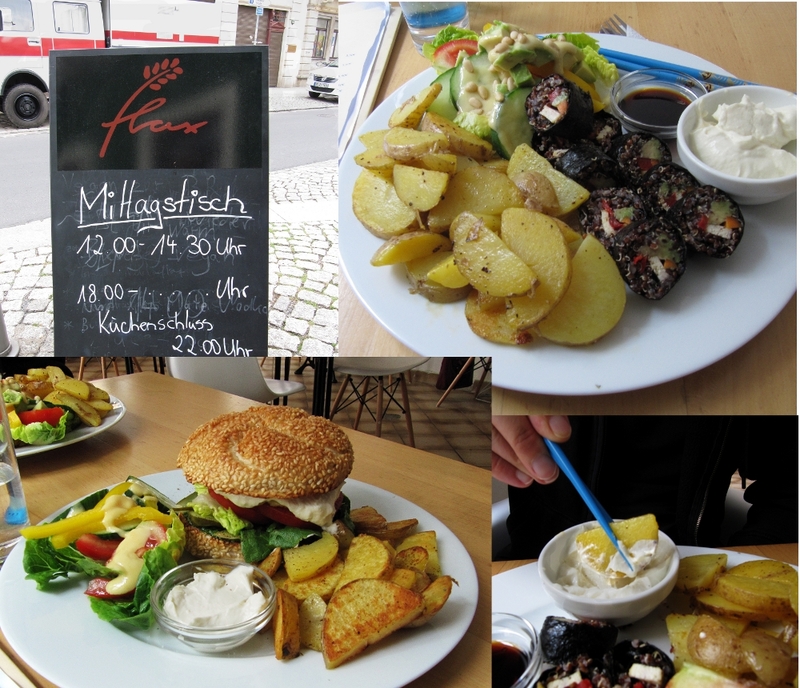 I can recommend both the Flax and the v-cake but there are many more vegan options in Dresden-Neustadt. I’ll write more about them in my next posts. Danke auf jeden Fall für diesen tollen Artikel, jetzt stehe ich zumindest essenstechnisch nicht mehr so planlos da! um Deine Entscheidung noch schwerer zu machen: der Dicke Schmidt und die Pizzastube sind auch sehr, sehr empfehlenswert! ich schreibe ein veganes Gutscheinbuch für Dresden. Du hast sehr schöne Fotos. Gerne würde ich sie in dem Büchlein abbilden. Würdest du mir die Fotos vom V-Cake und Flax zur Verfügung stellen? Komme leider mit deiner Kontaktmöglichkeit net klar, so auf diesem Wege. Bin grad beim googeln wieder hier gelandet, da ich am Donnerstag mit meinem Freund für 5 Tage nach Dresden fahr. Aber ich glaube, außer dem café muss ich nichts neues ausprobieren. Freu mich aber schon wieder aufs flax! Warst Du schon mal im Tanteleuk auf der Louisenstraße? Das ist ein sehr schönes Kaffee! Es ist nicht vegan, aber es gibt immer vegane Muffins, mindestens einen veganen Kuchen, Sandwiches (schnell ausverkauft) und am Wochenende vegane Bagel zum Frühstück. Kann ich sehr empfehlen! I’m absolutely looking forward to your other posts about vegan food in Dresden! 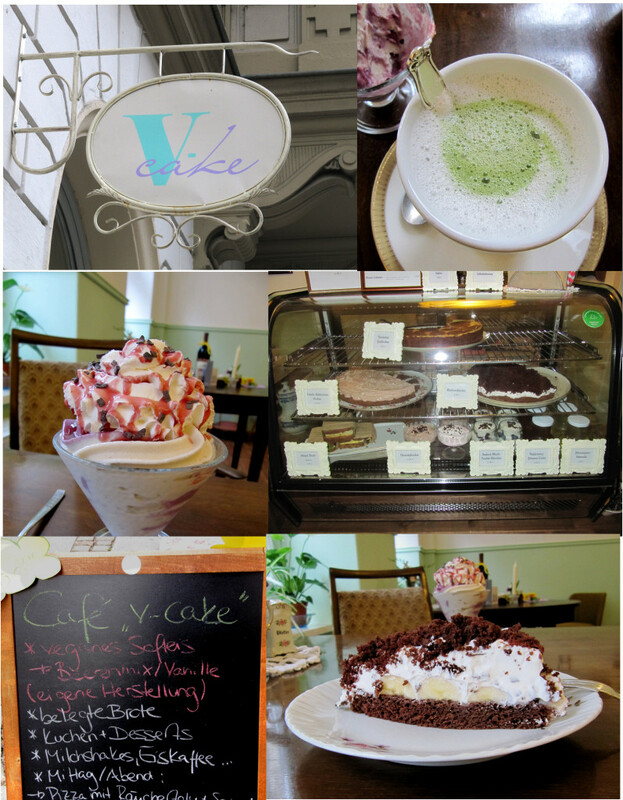 I already tried v-cake – the cake was awesome but I found the Matcha Latte a bit awkward. All the best (from Dresden, too)! So pleased to see Dresden isn’t being left out when it comes to vegan food. Zest was my absolute favourite spot in Leipzig, we moved back to New Zealand from there 18months ago. I am a bit envious that you have one of my fellow kiwi’s in your neighborhood, especially as the selection of vegan eateries in New Zealand is very slim, they love their meat here :( I would love to get in contact with Chloe, she may know of places I can visit. Absolutely amazing to see such progress! It beats buying some bread and a soya yogurt at the bio! Now we have a good reason to come back to Dresden. Hope you and your family are well, Mihl. Wow, Dresden is definitely looking up! I want that burger, and the potatoes look fantastic too. I went to Germany for the first time in April- Berlin, and was amazed by all the vegan options. Nice to know veganism is being recognized outside the capital. oh, so i need to come back soon and try out the cake! Trip to Dresden is overdue anyway…… thanks for this mouthwatering post. It’s annoying to try to find good vegan places while traveling but this helps a lot because I know where I want to go! I’m dropping what I’m doing (nothing) and moving to Dresden for that mole cake. Holy mole-y. I take that as a promise. Mole cake for you every day.